Today, in the existing competitive market, proper management of the supply chain has attracted a lot of attention to increasing profitability and customer satisfaction. Managers and decision-makers may use policies to survive in this situation, but a desirable outcome will only come when a precise and comprehensive model is used. Therefore, a detailed design and systematic planning of the supply chain seems necessary with all levels and units in order to increase the efficiency of the entire supply chain. In this research, two main objectives will be considered using multi-objective optimization methods. The first goal is to minimize the total cost of locating the warehouses in the supply chain, and the second goal is to maximize the level of customer satisfaction and service level of Bonny Chow Company. Computational results show the acceptable performance of the proposed method on a set of real-sized instances and demonstrate its efficiency in solving generated scenarios. Alavidoost, M., Tarimoradi, M., and Zarandi, M. F., (2018). "Bi-Objective Mixed-Integer Nonlinear Programming for Multi-Commodity Tri-Echelon Supply Chain Networks", Journal of Intelligent Manufacturing, Vol. 29, pp. 809-826. Baghalian, A., Rezapour, S., and Farahani, R. Z., (2013). "Robust Supply Chain Network Design with Service Level against Disruptions and Demand Uncertainties: A Real-Life Case", European Journal of Operational Research, Vol. 227, pp. 199-215. Barreto, S., Ferreira, C., Paixao, J., and Santos, B. S., (2007). "Using Clustering Analysis in a Capacitated Location-Routing Problem", European Journal of Operational Research, Vol. 179, pp. 968-977. Govindan, K., Jafarian, A., Khodaverdi, R., and Devika, K., (2014). "Two-Echelon Multiple-Vehicle Location–Routing Problem with Time Windows for Optimization Of Sustainable Supply Chain Network Of Perishable Food", International Journal of Production Economics, Vol. 152, pp. 9-28. Javid, A. A., and Azad, N., (2010). "Incorporating Location, Routing and Inventory Decisions in Supply Chain Network Design", Transportation Research Part E: Logistics and Transportation Review, Vol. 46, pp. 582-597. Lambert, D. M., Robeson, J. F., and Stock, J. R., (1978). "An Appraisal of the Integrated Physical Distribution Management Concept. International Journal of Physical Distribution & Materials Management, Vol. 9, pp. 74-88. Laporte, G., and Nobert, Y., (1981). "An Exact Algorithm for Minimizing Routing and Operating Costs in Depot Location", European Journal of Operational Research, Vol. 6, pp. 224-226. Lopes, R. B., Ferreira, C., Santos, B. S., and Barreto, S., (2013). "A Taxonomical Analysis, Current Methods and Objectives on Location‐Routing Problems", International Transactions in Operational Research, Vol. 20, pp.795-822. Maranzana, F. (1964). "On The Location Of Supply Points To Minimize Transport Costs", Journal of the Operational Research Society, 15, 261-270. Mogale, D., Kumar, M., Kumar, S. K., and Tiwari, M. K., (2018). "Grain Silo Location-Allocation Problem with Dwell Time for Optimization of Food Grain Supply Chain Network", Transportation Research Part E: Logistics and Transportation Review, Vol. 111, pp. 40-69. Park, B. J., Choi, H. R., and Kang, M. H., (2007). "Integration of Production and Distribution Planning Using a Genetic Algorithm in Supply Chain Management", Analysis and Design of Intelligent Systems Using Soft Computing Techniques. Springer. Rabbani, M., Aliabadi, L., Heidari, R., and Farrokhi-Asl, H., (2017). 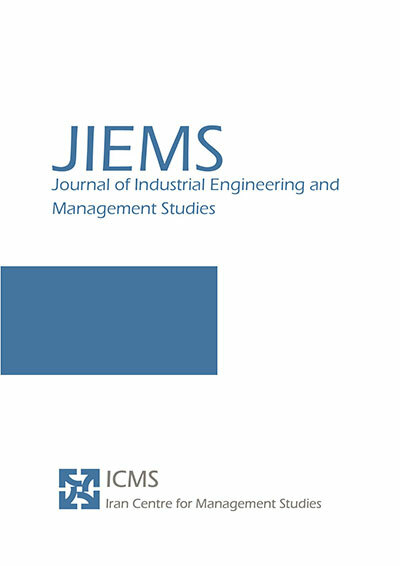 "Applying Queuing Theory for a Reliable Integrated Location –Inventory Problem under Facility Disruption Risks", Journal of Industrial Engineering and Management Studies, Vol. 4, pp. 1-18. Ramezani, M., (2014). "A Queuing-Location Model For In Multi-Product Supply Chain with Lead Time under Uncertainty", Journal of Industrial Engineering and Management Studies, Vol. 1, pp. 31-42. Rath, S., and Gutjahr, W. J., (2014). "A Math-Heuristic for the Warehouse Location–Routing Problem in Disaster Relief", Computers & Operations Research, Vol. 42, pp. 25-39. Toro, E. M., Franco, J. F., Echeverri, M. G., and Guimarães, F. G., (2017). "A Multi-Objective Model For The Green Capacitated Location-Routing Problem Considering Environmental Impact", Computers & Industrial Engineering, Vol. 110, pp. 114-125. Tuzun, D., and Burke, L. I. (1999). "A Two-Phase Tabu Search Approach to the Location Routing Problem", European Journal of Operational Research, Vol. 116, pp. 87-99. Vahdani, B., Veysmoradi, D., Noori, F., and Mansour, F., (2018). "Two-Stage Multi-Objective Location-Routing-Inventory Model for Humanitarian Logistics Network Design under Uncertainty", International Journal of Disaster Risk Reduction, Vol. 27, pp. 290-306. Walther, G., Schatka, A., and Spengler, T.S., (2012). "Design of Regional Production Networks for Second Generation Synthetic Bio-Fuel–A Case Study in Northern Germany", European Journal of Operational Research, Vol. 218, pp. 280-292. Wang, F., Lai, X., and Shi, N., (2011). "A Multi-Objective Optimization for Green Supply Chain Network Design", Decision Support Systems, Vol. 51, pp. 262-269. Yu, J., Gan, M., Ni, S., and Chen, D., (2018). "Multi-Objective Models and Real Case Study for Dual-Channel Fap Supply Chain Network Design With Fuzzy Information", Journal of Intelligent Manufacturing, Vol. 29, pp. 389-403.